What did Queen Elizabeth II give to Agatha? She was made Dame Commander of the British Empire (esentially equivalent of Knighthood but for females) by Queen Elizabeth.Agatha Christie won the Commander of the Order of the British Empire decoration in 1956 for being the most popular British crime mystery writer. Her husband received the same decoration in 1960, his for archaeology. Max received a knighthood in 1968, giving them the titles of Sir Max and Lady Mallowan. 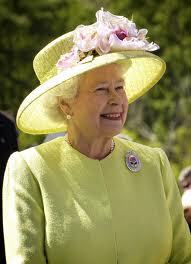 Agatha received an Order of Dame Commander of the British Empire in 1971 from Queen Elizabeth II. Throughout the time Agatha Christie is Christie is the best-selling novelist of all time and according to the to Index Translationum, Christie is the most translated individual author, with only the collective corporate works of Walt Disney Productions surpassing her. She published two autobiographies: a posthumous one covering childhood to old age; and another chronicling several seasons of archaeological excavation in Syria and Iraq with her second husband, archaeologist Max Mallowan. This entry was posted on May 12, 2012 by fdominguez22. It was filed under Uncategorized .